family run business employing traditional craftsmanship skills in the creation of memorials. With a wealth of experience and close links with the local community, churches and cemeteries, our friendly staff are always available to help and advise on your special memorial. Our friendly professional team ensure a consistent quality of memorial and our continued investment in modern machinery enables us to maintain our high standards, heritage and reputation in memorial masonry. Our service is fully bespoke to ensure all the clients needs are met in full. Banbury Memorials have over 200 years combined experience with key individuals having lifelong careers as stonemasons and are dedicated to maintaining the traditional skills of the stonemason and letter carver. 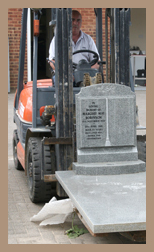 Banbury Memorials are experienced in dealing with churches, cemeteries and local authorities direct. Our professionalism and expertise have been widely recognised - we are in fact one of the few members of BRAMM (British Register of Accredited Memorial Masons) in the Oxfordshire area. This membership also extends to our members of staff who also hold individual licences.